One of those companies is Vanguard – they’re based in Malvern, PA, but have created an “Innovation Studio” in Center City Philadelphia! Being a company with a strong belief in advancement, both for the company and the individual, the Innovation Studio is the place where crewmembers at Vanguard research problems and develop solutions to make investing easier, more intuitive, and more effective for Vanguard clients. Tell us a bit about Vanguard. What is Vanguard’s mission? Vanguard is one of the world’s largest investment management companies. Our headquarters are in Malvern, PA, and in July 2017 we opened the Innovation Studio in Philadelphia—which is where I work. Our mission is to take a stand for all investors, to treat them fairly, and to give them the best chance for investment success. This mission is really at the heart of everything we do and, since joining the company, it’s been refreshing to see just how many of our crewmembers (what we call employees! ), from all levels of the organization, embody our mission each and every day. What is your career in the Vanguard Innovation Studio like? What excites you most about working in the Innovation Studio and Vanguard? I was hired to be the Operations Manager at the Innovation Studio in the fall of 2017. In this role, I coordinate and manage logistics to keep the Studio running smoothly. I am also in charge of our ecosystem engagement strategy as well as marketing and events at the studio. We love being in the heart of the city and want to make sure we are active members in the community. What excites me the most about working in this role is the culture at the studio. The different teams use design thinking and lean methodologies in their work. Those principles permeate throughout the studio no matter the role. You’re constantly problem-solving and iterating on your ideas and work. It’s a collaborative, creative environment and I find the energetic atmosphere makes it enjoyable to come to work every day. What was your major at American University? How has your academic career prepared you for your professional career? I graduated from American with a B.S. Business Administration with a marketing concentration and a B.A Music with a vocal performance concentration. The business degree provided me with a strong foundation of business principles to enter the workforce. The music degree helped me develop what I would call transferable skills. As a musician you are constantly analyzing aspects of the music, collaborating with peers, iterating on performances in real-time, and offering constructive criticism for your own work and others’. It teaches you empathy and work ethic. Because so much time is spent practicing alone, you learn to be a self-starter and need to be able to work autonomously. These are all skills I put to use every day and are important for any job, no matter the industry. Coming out of college is a culture shock to most students. Can you tell us about your experience transitioning from college to the real world? Were you scared? Were you excited? How did you hone these emotions? When I left college I was certainly excited. The job I had lined up was in an industry I loved where I would get to see the world and it really felt like I was about to embark on the “first day of the rest of my life.” But even though I was excited, I was also nervous. I grew up in Saint Louis and hadn’t known anyone in DC when I moved there for college, but somehow moving to Philadelphia to start my career without knowing anyone made me truly feel alone. For the first few months, it was difficult. But like any new situation, you have to be resilient. I focused on learning my job and making friends. During the day, I would go to work, ask questions, and try to learn everything I could. At night, I met up with friends of friends, found a choir to sing in, and joined a quizzo team. There were weeks this went well and weeks I wanted to move back home, but you just have to take one step at a time. Soon enough, I was running with my role at work and I’d made friends. Not only was I singing in choir, but I was also singing weddings, teaching voice lessons, and eventually conducting a small children’s choir. Again, it was difficult, but sometimes you just have to put yourself out there. Now, Philly really does feel like home. Tell us about your career path leading up to Vanguard. What was the jump from tour arrangements to Vanguard like? Right after graduating college I moved to Philadelphia to take a job planning tours for choirs and orchestras. This was a great way for me to stay in the classical music world without going into performing, something I knew I didn’t want to do. At that company I sold, managed, and operated tours. Because it was a small company, I was able to take on many responsibilities early on and gained exposure to almost every facet of the business. I was also given a great deal of autonomy so I was able to make decisions during planning, coordination, and execution that I thought were best for my groups. Vanguard is obviously in a much different business than tour consulting. I’m now working with a much larger team doing very different work, but there were many skills and lessons I learned and perfected at my first job that I use every day, including: creativity, flexibility, project management, and problem-solving. These are universal skills that can benefit you in any job, so while I’m now working on very different work and am developing new skills, it feels more like a continuation in growth than a complete change. As someone who’s worked in the Greater Philadelphia Area since graduation, what makes you want to keep your career here? There is so much going on in Philadelphia. Whether it’s our amazing food scene with world-class chefs, festivals that seem to pop up every weekend, or our growing hub of innovation—exciting things are happening in Philly. I love that the city is so culturally diverse, that the city is walkable enough that I don’t need a car, an that rent is relatively affordable. I love that talks and events always seem to be happening and that I’ll likely run into people I know. Philly has everything I was looking for in a big city while still feeling small enough that it feels like home. I think you’re going to be stuck with this Midwest transplant for awhile! How do/did you build your professional network? How does connecting with others help you in your career? Two ways – The first is that I always say yes when a friend or colleague offers to introduce me to someone they think might have similar experiences or be a good person to talk to for advice. Having people who have been in your position and can serve as a mentor or even a sounding board for your ideas is invaluable. Secondly, I attend events that cover topics I’m interested in, whether it’s related to my career or not. Something I love about Philly is the number of diverse and inexpensive events that are held in this city and I’ve met so many people who are now within my professional network by bonding over shared interests at these events. Anyone will tell you that networking is crucial to finding a job, but beyond that I have found that having a strong professional network can make you better at the job you have as well. The people I have met and listened to at many of these events have different perspectives and experiences than my own. By talking with them, I’ve been able to apply their learnings to my own work and come up with ideas I wouldn’t have thought of in my own echo chamber. If you could offer one piece of advice to a college freshman, what would it be? Try something completely new and see where it takes you. Don’t think you’re athletic? Join a running club. Don’t think you’re musical? Sign up for choir. Think you hate science? Try out that class on epigenetics. The worst that can happen is you find out you were right. Even if you don’t decide to change your major or suddenly find you’re the next Olympic athlete it will give you a new perspective and maybe even some funny stories to tell your family over winter break. If you could offer one piece of advice to a college senior who is soon to graduate, what would you tell them? Don’t worry so much about what your future is going to be. By now, everyone has probably started asking you, “What are you doing with your life?” Don’t worry about that yet. You don’t need to have your whole life figured out right now. Have a vision for the future, but know that you will learn so much in the next few years and have so many opportunities ahead of you that you can’t possibly know the exact path you’ll take. All you need to do right now is figure out the next step. And that next step is not going to define the rest of your life. You’ll have many moments over the course of a lifetime to do that. Separately, buy a Crock-Pot. It makes cooking dinner for the week so much easier! While this is not an advertisement, Campus Philly whole-heartedly supports that everyone buy a Crock-Pot early in their adulthood. For more advice on using every moment to your advantage and discovering your life and career, visit the Campus Philly Launch site at CampusPhilly.org/Launch! Check out some of our previous interview blogs for advice on finding your career, and follow Campus Philly on Instagram (@CampusPhilly) to find out about more events that can connect you with exciting events in Philly, fellow college students, and your perfect career match. 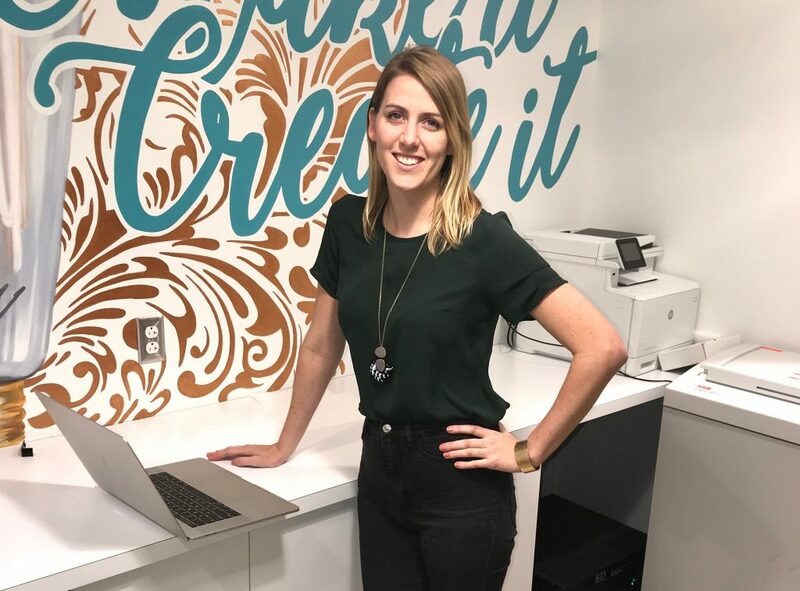 Colleen started her career at Vanguard in 2017 as the Operations Manager for the Innovation Studio. Apart from operations she also focuses on marketing and event strategy. Previously she worked in the Philadelphia area at ACFEA Tour Consultants managing international and domestic tours for choirs and orchestras. She graduated with a B.S. in Business Administration and a B.A. in Music from American University. Outside of work, she enjoys traveling, singing and trivia nights.